Homemade yogurt is key, as I found out from discerning tastebuds. But, store-bought yogurt like Wallaby comes pretty close to the homemade yogurt that is perfect for kadhi. There are at least two desi yogurt brands in the market now, Gopi and Desi Dahi, that work rather well, too. Dawn strains her yogurt, giving her kadhi a consistent smooth texture. I also liked that she used whey to help push the yogurt through the strainer. In addition to yogurt, Dawn uses a half pint of cultured low-fat buttermilk. This adds a level of tartness that is often missing in store-bought yogurt. Or in winter, when no matter what you do, the yogurt will not become tart. This is Dawn's twist to the recipe. She noticed that some people use tart homemade yogurt while others used buttermilk; so she decided to combine the two! 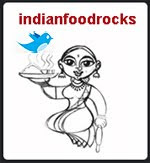 Dawn has learned from the best and like most Indian homecooks, she cooks by look, feel and smell. She adds just enough besan to change the whiteness of yogurt into a pale manila color. She uses as much ginger as chopped serranos. Cooking is, indeed, an art as well as a science. While the kadhi was simmering on the stove-top, she quickly grated a zucchini for pakodas. You could use yellow squash, spinach, methi leaves or a combination of these in the pakodas. Dawn drops her pakoda batter into hot oil the Indian way, by hand. You could aim for pakodas that are more rounded but the shape really does not matter. Out of habit, I made slightly bigger pakodas but the ones Dawn made were much smaller. This meant that there were leftover pakodas to snack on immediately. There are rewards for making kadhi with pakodas! I could not wait to for the pakodas to absorb the spicy goodness of the kadhi. Like most Indian dishes, this kadhi is given a final garnish of chopped cilantro. The aromas in Dawn's carefully designed hi-tech kitchen were pretty amazing by this time. Now tell me, isn't this the prettiest looking kadhi you have ever seen?! It is Medha's favorite kadhi. More dear than the regular kadhi I make. Dawn does not always make pakodas to add to this kadhi. It depends on how much time she has on hand. Quite honestly, this kadhi is great by itself, too. When I got home, I made Dawn's kadhi, following her exact steps and measures. It was close but not the same. There were a couple of things that made a difference: store-bought yogurt and the cook. I told Medha that Dawn made the kadhi and I only made the pakodas that were floating in it. She said it was pretty tasty but that it fell a little short of the usual kadhi. These were the discerning taste-buds that I referred to at the beginning of this post. I strongly believe that there is a lot to be said for the cook. That the magic lies in the hands of the person who touches the ingredients to build a dish with layered flavors and multiple textures. Yes, indeed, Dawn remains the Queen of Kadhi! Whisk besan into strained yogurt until all the lumps disappear. Add only as much besan as needed to change the color of the yogurt to a pale manila color. Add turmeric powder, red chile powder and salt to this yogurt mixture and whisk until mixed. Heat oil on medium-high in a medium pot and when it shimmers, add a pinch of hing. When that sizzles, add mustard seeds. When the mustard seeds pop, add methi seeds and turn down the heat immediately. If necessary, take the pot off the stove. Gently swirl the oil around, cooling the pot, so that the methi seeds do not burn. They should take on a toasty golden color. Add ginger and the chopped serrano to the oil. Put the pot back on the stove and add the whisked yogurt mixture. Add buttermilk to the mixing bowl that held the whisked yogurt and only then add to the pot. This is a very Indian way of doing things. It ensures that all spices are transferred to the cooking pot and there is next to no waste! Add as much water as you like to thin out the kadhi, keeping in mind that it will thicken as the besan cooks. Turn the heat back up to medium-high and bring this mixture to a boil. Set the timer for 15 minutes, turn to low and simmer until done. If you're not making pakodas, garnish with chopped cilantro serve this over hot steamed rice. Mix all ingredients for pakodas in a medium bowl. Add 4 tbsp besan and mix into the vegetables. Depending on how juicy the zucchini is, add as much more besan as is required to make a batter that is thicker than pancake batter. Drop teaspoonfuls of batter into the hot oil or do it the Indian way, by hand, and fry the pakodas until golden-brown in color. Add more water to the kadhi as required to bring it to a consistency that you like. It should not be too thick at this point. Add about 14-15 small pakodas. Put the pot back on the stove and bring to a boil. Simmer for 5 minutes and serve hot over steamed rice. We are in love with this kadhi! The kadhi itself comes together very quickly and the pakodas are an added bonus. Use a bigger fine mesh strainer to strain the yogurt quickly. Substitute serrano with dried red chiles, for a slight change in flavor. To change it around some more, add asafetida when the kadhi is simmering instead of adding it to the hot oil at the beginning. Oh yeah! She's very happy! It's super warm out here today but I can eat kadhi any time of the year :) sometime just as soup. I don't make this kind of pakoda as the hubby prefers only besan pakoda with kadhi but i am gonna try this next for sure. One can also use ready made salted Boondi instead of Pakoras if needed. Your friend Dawn has mastered the art of making Perfect Kadhi. Thanks for the recipe. This sounds delicious Manisha. I just checked my favourite Indian takeaway menu but sadly the don't have it on the menu. That looks really nice! The kadhi is simpler than the Punjabi-ish monstrosity that I usually make, but her pakodas are giving me ideas- never thought of trying shredded zucchini (or loki when in season)! And fresh ginger... really nice. I had no clue that I could drop these mince-y pakore by hand either... hmmm. Sunshine, I know exactly what you mean! And that's because kadhi is comfort food! Namitha, thank you! I love pulissery! I haven't had it with pineapple though. I need to make some soon! Gaurav, thanks! It is perfect! And, thank you for mentioning that boondi can be used as a substitute for pakodas. But I must confess that I prefer boondi raita to boondi kadhi. Barbara, it is! And unfortunately, you won't find it on most menus in Indian restaurants as it is considered "everyday fare." The z. pakoras! for next time. I do not like kadhi :( but make very often as A loves it. The methi is fantastic in kadhi and I love the color and the tiny pakoras. Love kadhi pakora. I am not surprised Dawn masted this. It is such a comfort food, no matter the ethnicity :-). Besides, don't a lot of India bloggers make cookies, cakes and other baked good all the time, probably more than Caucasians and no one objects to them being better bakers(? ), do they? Such a great click of Medha. Also, great recipe! Must- try, it looks like. I love all kinds of kadhis: this type, the thicker Punjabi style, the Maharashrian, as well as the Gujju one! Kadhi, a lot like your regular kind, with Khichdi is what was for dinner last night! Love the idea of zucchini in the pakodas! Recently I ate one with spinach pakoras and it was very good. Thad Kadhi plate is perfect; strangely it works for a wet spring day or a hot summer day too! Loved the pictures, had a very warm cozy feel to it. And I love Kadhi just like Medha but I have no dawn here, neither Dusk to make me a kadhi just like that. The buttermilk is what I don't add, good tip. What brilliant photographs!! what a coincidence.. pakode wali kadhi is whats made for dinner today!!! Priya, coconut+cumin+green chiles = heaven! Try this one, you will like it, too! Soma, methi makes a huge difference! I like that the pakodas are small. They can only soak up that much kadhi and it doesn't become pakodas in thick goop. I don't like my kadhi to be really thick. In that case, I might as well make pithla! DSM, I think she may have been marveling rather than objecting, which doesn't change how inappropriate it is! Nandu, but you see Pel doesn't make his own kadhi. Go on! Ask him. Anita, it took me a while to warm up to North Indian kadhis as they were much thicker but now I love all types of kadhis. Any squash or greens make a great addition to the pakodas, I agree! Shri, it's all weather food! BM, I thought that buttermilk is a great idea, too! Let me know if you try it! baker, you, too?! Great minds, I say! You, me and Anita! I want to make this today. Looks so good. there was no tadka to this kadhi? Im a maharashtrian married to a punjabi and Ive seen my MIL make the pakode wali kadhi (a recipe Ive adopted since) and there is an awesome jeera/mustard/red whole chillies tadka to it that I think takes the kadhi to the next level. I like the buttermilk idea - I have some sitting in my fridge that needs to be used and today's the day it'll find its cause! Shilpa, let me know if you do! It's real nice to see a non-desi making *awesome* kadhi. I love kadhi ( Marathi / Gujarati/ Punjabi or mor kuzhambu- I classify it under TamBhram kadhi) and it is pure comfort food. That's a beautiful shot of kadhi. I love that Dawn added grated zucchini to the pakora! It's so easy to get in a rut and think you have to do a dish the same way you always have. Really refreshing take on it! In my mom's kadhi, we generally add garlic or garlic scapes, fennel seeds, and dried red chilies to the tadka. But it may just be a Gujarati thing. It just amazes me how many variations there are to any dish and each of them will taste so unique! I have this kadhi bookmarked. will be trying it this weekend. Alpa, I think there as many variations to kadhi as there are communities in India! I like the idea of adding garlic scapes. There is a Mahrashtrian version that uses garlic and red chiles to the tadka. For me now, I add a combination of spices and aromatics based on my mood and what I have on hand! whenwillyoube100, yes it is! Thanks! Mandira, I hope you liked it! I am new to Indian cooking and ingredients. Mostly due to a desire to help my husband with diabetes management. I have not yet become familiar with hing. I have a market with Indian ingredients I can check. Is it in with spices? Is it a powder. Etc? Thank you for sharing these recipes. Yes, hing is usually stocked with spices. You can find hing in "rock" (solid) form or in powder form. Most Indian grocery stores have the latter. It may or may not have added wheat flour or wheat germ to make it "flow." If you have Savory Spice Shop near you, you should be able to find it there, too. Our local shop in Boulder has it mixed with fenugreek powder, which changes its flavor profile somewhat but still works well for Indian food. I hope this helps!